Phil Barnes looked around the Trabant Center Theater during a break and saw exactly what he hoped to see at the University of Delaware’s two-day Smart Cities and Sustainable Energy symposium. “I see two Newark City Council members talking to faculty members, we just listened to a state transportation director and now I see him shaking hands with an urban planner,” he said. Many disciplines from throughout the University were represented – including engineering, public policy, energy, environment, finance and materials science – demonstrating the complexity of the challenges facing cities and developing nations in the future. “The value of having this in Delaware, with the smallness of this state and a venue like this, is that you get so many different practitioners and academics together at the same time,” said Barnes, associate policy scientist and assistant professor in the School of Public Policy and Administration. “The University of Delaware is well-positioned, if not uniquely so, to organize and catalyze leadership in the area of smart cities and sustainable energy,” said Charles Riordan, vice president for research scholarship and innovation. This symposium was meant to set the table for just that. And conference co-chairs – Prof. Nii Attoh-Okine of the College of Engineering and Associate Research Prof. Lawrence Agbemabiese of the Energy and Environmental Policy Program – invited a wide variety of thinkers and practitioners, which allowed for expansive, informed discussion and some interesting debate. “We understand this problem requires an interdisciplinary approach,” said Babatunde Ogunnaike, dean of the College of Engineering. And that is one reason the University will launch an Institute of Data Science in the spring of 2018. “If you don’t have the understanding, the technology to understand the data, you are not going to get the information you need,” he said. 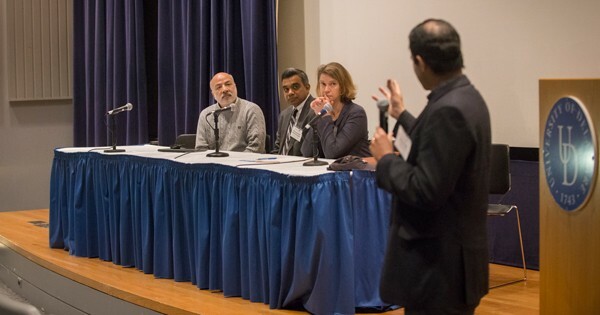 Saleem Ali, Blue & Gold Professor of Energy and the Environment, moderated a panel on climate change and sustainability. He serves on a working group of the United Nations’ International Resource Panel, which is trying to address issues of resource efficiency around the world. But getting good information on global energy and climate situations is a daunting challenge, said Andrea Sarzynski, associate professor in UD’s School of Public Policy and Administration, because useful data are hard to come by. Differing definitions, gaps in information and other challenges also make it hard to know the impact of existing policies, she said. On a smaller scale, the Delaware Department of Transportation collects enormous amounts of data as it monitors the state’s roadways and transit system and generates plans. “The weakest link in an automobile today is the driver,” he said. When “connected” automobiles – those that sense and respond to other vehicles to avoid collisions – prevent accidents, they are also preventing traffic delays, he said. And automated vehicles can expand mobility for the elderly and those with disabilities because the vehicle can come to them, he said. Connected autonomous vehicles are a focus of research for Andreas Malikopoulos, associate professor of mechanical engineering. He offered a fascinating look into automated mobility systems, including a model city he and his students have built in UD’s Spencer Lab to test ideas and assorted variables. Among the things he is studying are how connected vehicles might make it possible to eliminate stop-and-go traffic through intersections – and whether that level of connectivity is scalable over many intersections, roundabouts and merge lanes. There are challenges in computer power, cybersecurity and what to do with vehicles that are not connected or automated. You can’t have pedestrians going through “automated” intersections either, Malikopoulos said. Grasso said he has been delighted to see so much work on “smart cities” at UD and believes the University could be a leader in that research. “Much of the progress that we will see in ‘Smart Communities’ will be market-driven and there will be hidden risks,” he said. “As we move toward Society 5.0 and the ‘Internet of Things’ becomes more prominent and we increasingly become dependent or desirous of it, we risk not only ceding privacy and security, but also control. India, for example, has a “city-centric” future, said Chandrasekar Govindarajulu, a UD alumnus who now leads the Clean Energy team at the International Finance Corporation in Washington D.C. Already it has 42 cities with more than 1 million people in them. And as the migration to cities continues, India will need to build the likes of one Chicago every year, he said. Prof. Ismat Shah, director of UD’s Energy and Environment Policy Program, recalled a day when his grandmother in Karachi, Pakistan, asked about his research. He started to explain his work in nanotechnology and she stopped him. Agbemabiese, who is from Ghana, said researchers are moving toward consensus on what a “smart city” is, but the term can be hijacked by those with different motivations. “You cannot have smart cities unless everyone has access to services,” he said. The United Nations predicts that the world will have 2.4 billion more urban residents by 2050, he said – pressure that must be addressed in energy, air quality and climate policy. He suggested three promising solutions – accelerating a shift to cleaner cooking (such as the use of propane, ethanol and low-emission cookstoves), scaling up renewable energy distribution, especially solar and boosting energy efficiency through building codes and standards. John Macomber of the Harvard Business School said “smartness” plays out much differently around the world. “If you have no electricity, one kilowatt hour can change your life,” he said. Addressing energy and environmental needs can change a city’s economic development significantly and Jeffrey Richardson, a project leader in UD’s Black American Studies, showed how his company – Imani Energy – is working to do that in Wilmington, Delaware, and in emerging projects in Africa. Two professors – UD’s Raymond Scattone of the Energy and Environmental Policy Program and Lemir Teron of the State University of New York’s College of Environmental Science and Forestry – made a strong case for pursuing “just urbanism” instead of “smart cities,” putting the emphasis on justice rather than smarts. Scattone said they see the idea of “smart cities” as a bad idea and nothing new, a catch phrase and nothing more than “neo-liberal technological mumbo jumbo.” The roots of the idea, he said, lie in private industry that is aiming to sell more computers and software. “If you’re moving toward a ‘smart city,’ is it inviting to those who don’t speak English?” Teron said. And what about those who live in areas without broadband Internet access? Troy Mix, a policy scientist with UD’s Institute of Public Administration, has been looking at that question in rural Delaware. That probably is significant, he said, but the research isn’t there yet. You could expect that areas with better access also have more jobs, higher quality jobs and better prospects for future growth since so many businesses require broadband Internet. Also in the mix were two members of Newark City Council – Chris Hamilton and Mark Morehead – who wanted to explore how the city might benefit from the research and ongoing projects. “This is a great opportunity for the city and the University to work together,” Hamilton said. “Many of us are trying to build that relationship. So much good could come of this. They’re researching other cities around the world – and they could research our city. It would benefit graduate students, professors and it’s a way to build a relationship.